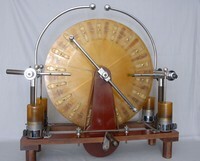 Two sets of cylinders or tubes are aligned within each other (this unit has three sets), in the picture only the outer tubes can be seen, one set is fixed and the other moves in and out by moving the shaft. This changes the capacitance of the unit. 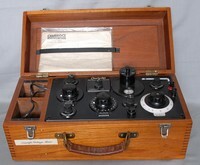 Designed by Philips in the 1930's similar devices were used in all there sets after this. Similar to that used in item A1116 the Philips 660 Wireless. 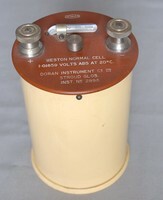 Light dependant resistor for use in alarm systems or counting in factories. Resistance of the unit varies with the light shone upon it, so if the light is interrupted the resistance will change. 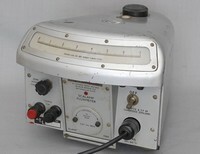 Switching by contacts immersed in Mercury is almost maintenance free, and can carry reasonable currents. 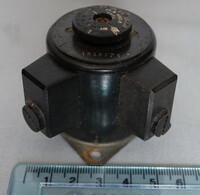 Variable capacitor value changed by sliding inner tube outwards, connections are two push wire clamps. Nothing more is known about this item. Board with 6 X Lamps one dated 1915, 7 X switches and switch sockets, one dated 1926 and 3 X cards of fuse wire. 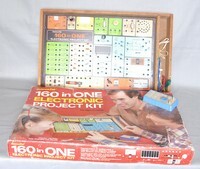 This board can be demonstrated. Various type of cable management including wooden trays or Ducts with covers and Porcelain blocks for running cables on the surface of walls to light switches etc. 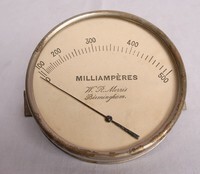 Also porcelain mountings for meter boards still seen today. 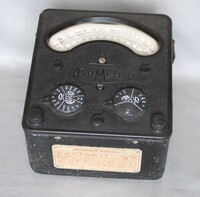 Dry batteries and accumulators (item A1237) were common before mains electricity was widely available, batteries continued for portable sets, as they do today. 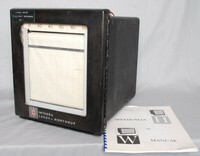 The picture represents some of the large types that were used with domestic wireless receivers from 1940 to 1960. Bottom row left to right. Ever Ready AD3 90V HT and 1.5V LT, Vidormax L5507 90V HT and 1.5V LT, Drydex Red Triangle H1136 with 23 taps providing LT HT and Grid Bias, Top row left to right. Exide H1146 90 Volts only, Ever Ready 762 45 volts only. Exide DM538 90 Volts only, and Ever Ready B126 90 volts only. 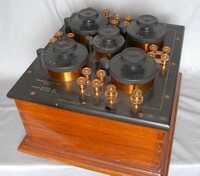 Speaker with multiple tapped Transformer for 11 X different impedance settings, which are set by the switch. Seven for single valve output stages, and four ranges for push-pull class 'B' output stages. 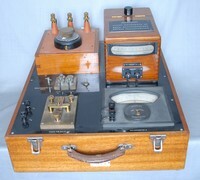 Shown at The Radio Show Olympia in August 1933. 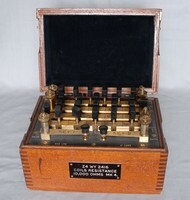 Used in the tuning circuit of early wireless receivers and crystal sets for changing the receivable wavelength. 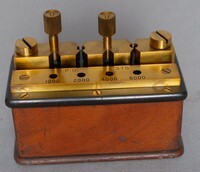 Tapped capacitor with selection by five knife switches marked .5-1-2-4 and 8 Micro farads.Probably used with early transmitters or receivers during WW1. 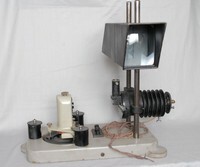 Used with Philips projector Television, Schmidt Optics system. 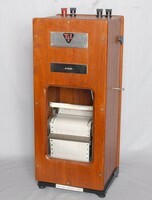 At the time only the UK and France had television services. This item could produce a picture 4ft x 3ft (1.22m x 0.91m). Used near Aerial lines but slightly higher, to attract lightning away from the aerial. A direct strike would not protect very much as the voltage would be high enough not only damage the aerial but also anything in the proximity of the wiring, however a near strike would send all received voltages to ground. In the case of Sheet lightning whole areas can be ionised causing the atmosphere to glow blue in colour, such strikes are generally dissipated and without the conductor wired to ground certain damage would occur. The base is for display only. Single pole lever switches switches were often used to protect wireless units from lightning damage, and were commonly seen on window ledges during the 1950's and before. Normally the lever is thrown to connect the aerial, when the operator is finished the lever is changed over to the other side, which is connected to earth. A direct strike would not protect very much as the voltage would be high enough not only damage the aerial but also anything in the proximity of the wiring, however a near strike would send all received voltages to ground. In the case of Sheet lightning whole areas can be ionised causing the atmosphere to glow blue in colour, such strikes are generally dissipated and without the switch being set to ground certain damage would occur. On some of the switches there is a spark gap in the On position, so that if the switch is not in the earth position some of the voltage can jump the gap. Double pole lever switch, these switches were often used to protect wireless units from lightning damage. Normally the lever is thrown to connect the aerial, when the operator is finished the lever is changed over to the other side, which is connected to earth. A direct strike would not protect very much as the voltage would be high enough not only damage the aerial but also anything in the proximity of the wiring, however a near strike would send all received voltages to ground. In the case of Sheet lightning whole areas can be ionised causing the atmosphere to glow blue in colour, such strikes are generally dissipated and without the switch being set to ground certain damage would occur. Telsen 4 pin and 5 pin Valve holders in original box. A large pocket screwdriver with detachable bits in the shape of a 4 pin valve, and made of Wood and Brass, with Steel bits. Box of Insulator pins for mounting a Wireless Aerial to the picture rail inside a room, giving an inside version instead of an Aerial outside the house. Signal strength for good reception would need to be good, as with early Wireless receivers were not as sensitive as today�s models. 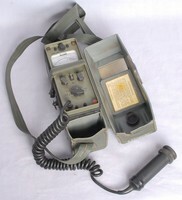 Battery used in portable Radio's for powering the valve heaters. 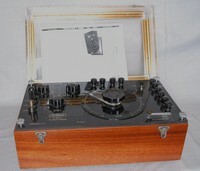 As long as portable valve receivers were still in use, Purchasing these batteries was possible. 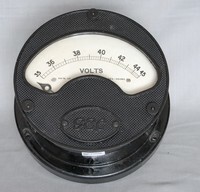 Grid Bias battery of 9 volts with taps down to 1.5 Volts, In early directly heated valve receivers there was no automatic bias for the valve grid, a battery was used to bias the valves grid negative for the correct operation of the valve. Harlie Tone switch presumably for headphones or an extension loudspeaker at each end is a pair of sockets for plugging in and out; the wiring inside passes straight through with a selection of condensers to alter high frequency response. 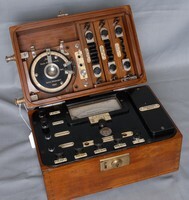 Crystals were used in assemblies for the detection or demodulation of radio waves, in early crystal sets. See Item A1318 The term Uralium is just as it says on the tin a trade name and the type of composition of the crystal is possibly Iron Pyrite or Galena. The same could be said of Hertzite. See Items A1494. The tin of Uralium also contains a spare wire coil known as a ''Cats Whisker''. Uralium is listed as a supposed new metallic element announced in 1879, its existence has not been confirmed. Two adjustable resistances with straight and circular adjustments. 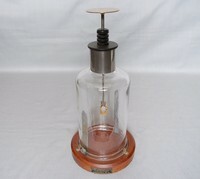 The straight version is made by Readirad and the circular is 400 ohms and is made by Igranic. Nothing is known about the maker Readirad. 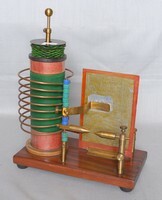 Aerial Coupling/Tuning coils used in ''Breadboard'' wireless sets during the 1930's. Marked inside ST 400 Aerial, which stands for Scott Taggard and was made for the home build ST400 set of 1932. On back of the box reads:- Instructions for fixing. Remove Aerial and Earth wire from set. Connect the red core of the twin lead to Aerial socket on set and black core of twin lead to Earth socket of set, (if there is no earth lead disregard this lead). Connect long single lead to Earth. If you have already an Earth fixed you can join this to the existing Earth, otherwise it will be necessary to add an extra length of Earth wire to Earth tube in the ground or to a water pipe. The performance of ''Jiffy'' Aerial (Trade Mark) is dependent on an efficient earth. Main object of this Aerial is it's amazing convenience. Museum comment. 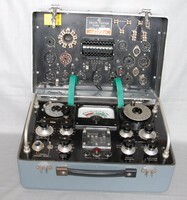 Unless you live within sight of the Broadcast Transmitter or extremely close this device would not be of much use, what is inside is a mystery, on test the only reading found was a capacitance of 0.001uF between input and output. 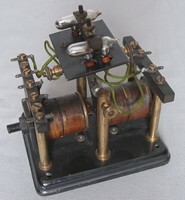 3 Variable condensers used in early wireless receivers, two in original boxes, the Graham Parish Litlos type is 0.0003uF. Price on the box 2/-, the Wavemaster is .00016uF. Detecting or Demodulating the wireless waves in the early days always seemed to be an enigma, eventually the thermionic diode proved a commercial solution, but much work was to be done with other devices, such as crystals such as Galena (Lead Sulphide) with a simple wire known as a ''Cats Whisker'' touching the surface, this was the forerunner to the Germanium Diode, which replaced many of these devices. See A1432 and A1435. Many attempts were made to create a junction between two different crystals as in this case, like the cat�s whisker method the junction is moveable, giving the impression that better reception can be found by touching the right spot. The type of crystal used in this case is unknown, Tellurium or Chalcopyrite and Zincite (Perikon) is one such possibility, but many more were tried. 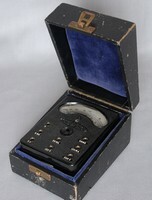 Crystal receivers were to become popular alternatives to expensive valve sets in the 1920's and the ordinary working man would make his own set at home, creating a popular pastime. A Grid Leak resistor is normally used between the grid of a thermionic valve and ground, in order for the valve to function correctly, if the grid was connected to a low impedance source such as a tuning or coupling coil then a capacitor is added across this resistor to provide a low impedance path. Far Left. 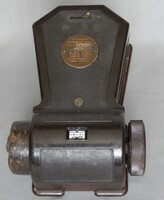 Lisson HF Choke 76mH not marked. Middle back. 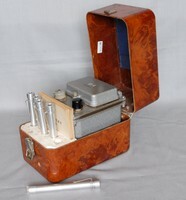 Lisson 0.0002uF Mica Condenser with resistor clips and box. 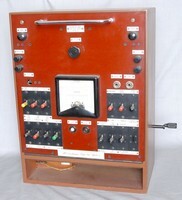 Middle Front. 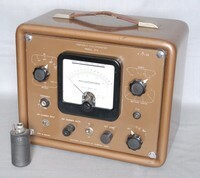 Lisson dual holder with two resistors, the terminals are marked LT & G (grid) on one side and P (plate) & HT on the other. Right back. 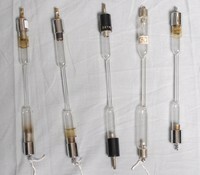 Dubilier Mica Condenser Type 620 0.0003uF and resistor on clips. Front right. Telsen Grid Leak resistor holder and box. Transformers designed for coupling valves between the anode of first valve to the grid of the next. 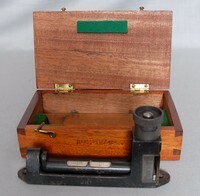 These were used in early breadboard type radio's home made or manufactured. 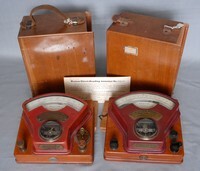 The item on the left was made by Radio Instruments of Croydon around the 1930's. Back right, Porcelain toggle light switches, notice the wire entry from the side, the house wiring would have been on the surface. 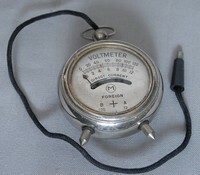 Front right, Turn type switch, most common in European countries this has two positions and can be used to switch two independent circuits. The Aerialite suppressor plug adaptor is rated at 4 amps and fits a standard round 3 pin 5 amp plug, this was used to suppress radio frequency interference from appliances such as Vacuum cleaners from wireless reception, with it's original box, made by Aerialite of Stalybridge Cheshire. 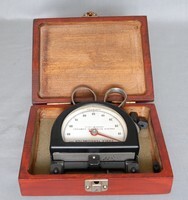 Spot Galvanometer with a 450 ohm movement made by Cambridge Instruments. In working order. 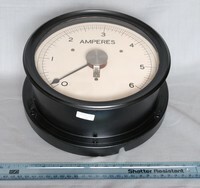 Calibrated scale for use with Mirror Galvanometers such as Items A0880. A0191 and A0202. 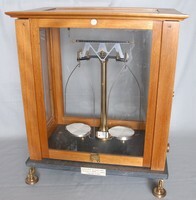 The dot of light reflected by the mirror in instrument is displayed on scales like these. 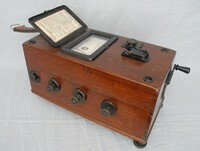 Made by the Western Electric Company in America during 1918. 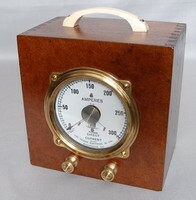 A moving coil meter called in this case a Galvanometer, with a full scale deflection of 20 Milliamp s, today it would be called just a moving coil meter. 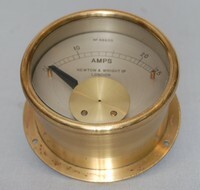 The movement is made by WECO (Western Electric Company) and the horseshoe magnet made by Weston Electric Company. 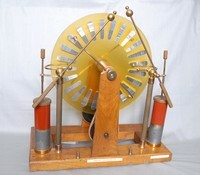 Based on Jacques Ars�ne D'Arsonval's moving coil galvanometer, manufactured on a large scale by the Weston Electrical Instrument Company of Newark, New Jersey, Robert William Paul (1869-l943) devised an instrument in which the moving parts were supported on a single bearing giving lower friction and therefore greater sensitivity. 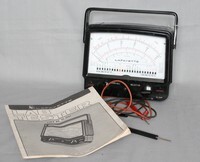 Other unipivot instruments followed. His instruments gained international recognition, winning gold medals at the 1904 St Louis Exposition and the 1910 Brussels Exhibition. 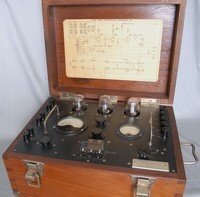 In November 1919, his business was bought by the Cambridge Scientific Instrument Company, which was renamed "The Cambridge and Paul Instrument Company." 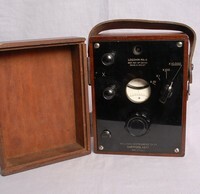 Cambridge Scientific Instrument Company was a company founded in 1881 by Horace Darwin (1851-1928) and Albert George Dew-Smith (1848-1903) to manufacture scientific instruments. Their partnership became a Limited Liability Company in 1895. In 1920 it took over the R.W. 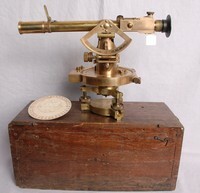 Paul Instrument Company of London, and became The Cambridge and Paul Instrument Company Ltd. 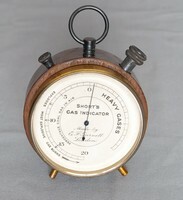 The name was shortened to the Cambridge Instrument Company Ltd. in 1924 when it was converted to a Public limited company. 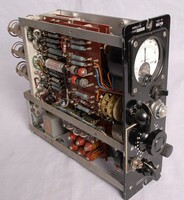 The company was finally taken over by the George Kent Group in 1968, forming the largest independent British manufacturer of industrial instruments. 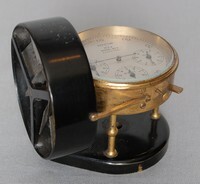 Used for measuring very small currents of electricity which when passed through the coil would deviate the needle from the magnetic north. See A0754. 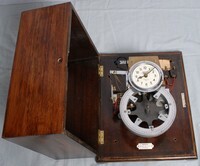 Astatic galvanometer made by Grimsdell Dix Acton London. An Astatic type has two needles in parallel mounted in opposite direction, to defeat the effect of the earth's field. 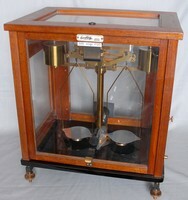 The mirror galvanometer was later improved by William Thomson, later to become Lord Kelvin. 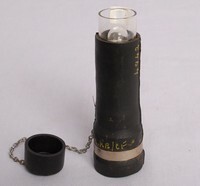 He would patent the device in 1858. 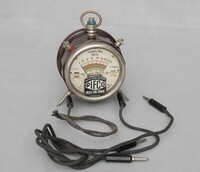 Thomson reacted to the need for an instrument that could indicate with sensibility all the variations of the current in a long cable. 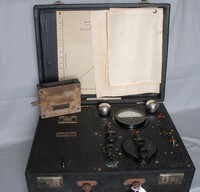 This instrument was far more sensitive than any which preceded it, enabling the detection of the slightest defect in the core of a cable during its manufacture and submersion. 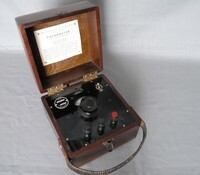 Moreover, it proved the best apparatus for receiving messages through a long cable. 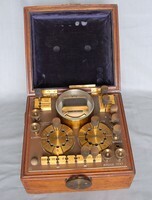 A mirror galvanometer is a mechanical meter that senses electric current, except that instead of moving a needle, it moves a mirror. The mirror reflects a beam of light, which projects onto a meter, and acts as a long, weightless, massless pointer. 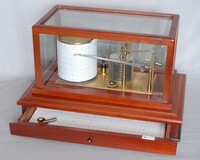 In 1826, Johann Christian Poggendorff developed the mirror galvanometer for detecting electric currents. 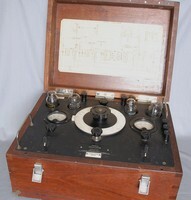 The apparatus is also known as a spot galvanometer after the spot of light produced in some models. 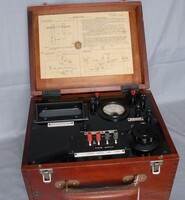 Mirror galvanometers were used extensively in scientific instruments before reliable, stable electronic amplifiers were available. 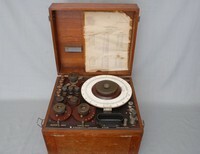 The most common uses were as recording equipment for seismometers and submarine cables used for telegraphy. 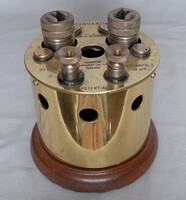 This model made by the Cambridge and Paul instrument Co has a mirror suspended from two threads instead of one. And is known as a Bi-filar type. Originally conceived by Albert Campbell. See the history above. 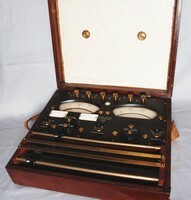 In December 1919 the Cambridge Scientific Instrument Company took over the smaller but successful Robert W. Paul(1869-1943) Instrument Company and became The Cambridge and Paul Instrument Company Ltd.
Mirror Galvanometer standard design of the period. 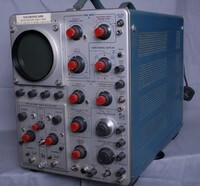 These instrument were becoming obsolete as Oscilloscopes were taking over,and have in this form have fallen out of use. 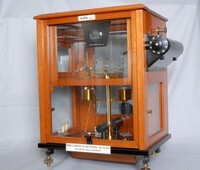 Mirror galvanometer systems are now used as beam positioning elements in laser optical systems.